Djibouti, 20 November 2018- The African Union (AU) in collaboration with the International Organization for Migration (IOM), the Intergovernmental Authority on Development (IGAD) and the Republic of Djibouti yesterday launched the 4th Pan African Forum on Migration (PAFOM) in Djibouti under the theme: ‘Harnessing the benefits of Free Movement of persons regime for sustainable development in Africa’ to provide a more focused engagement with all relevant Migration stakeholders including Regional Economic Communities (RECs), AU Member States, private sector, academia, parliamentarians, African diaspora community and civil society organizations in Africa and to discuss among others; achievements and challenges of free movement of persons regimes in Africa and examine the urgency to promote effective labour migration governance. The PAFOM will focus in three main topics: free movement of people in Africa; Global Compact for Migration; and harnessing the benefits of migration. Labour mobility will be a key area of focus at the fourth PAFOM. The benefits, challenges as well as how to advance free labour movement will all be discussed at the Forum. The Pan African Forum on Migration opened officially by the Prime Minister of Djibouti H.E. Abdoulkader Kamil Mohamed who welcomed the participants of the forum on behalf of the government and people of Djibouti. He further reiterated the importance of the meeting in order to promote a common understanding migration issues in the continent. In her keynote address, the Director of Social Affairs Department Mrs. Cisse Mariamma thanked the Government of Djibouti for hosting the meeting and supporting the participants and guests attending this meeting. She also thanked AU partners, specifically, IGAD and IOM, who have been very handy in supporting AU Commission to organise the meeting and for their generous contribution in making this meeting a success. Mrs. Cisse urged all partners to support AU efforts in strengthening the PAFOM, especially as it moves in the implementation of the Global Compact on Migration (GCM) after the international conference in Marrakesh, Morocco in December.” PAFOM not only providing us an opportunity to bring all Regional migration agenda together for us to learn from each other, but also provide a follow up on the implementation of the GCM in the continent” concluded Mrs. Cisse. 1. 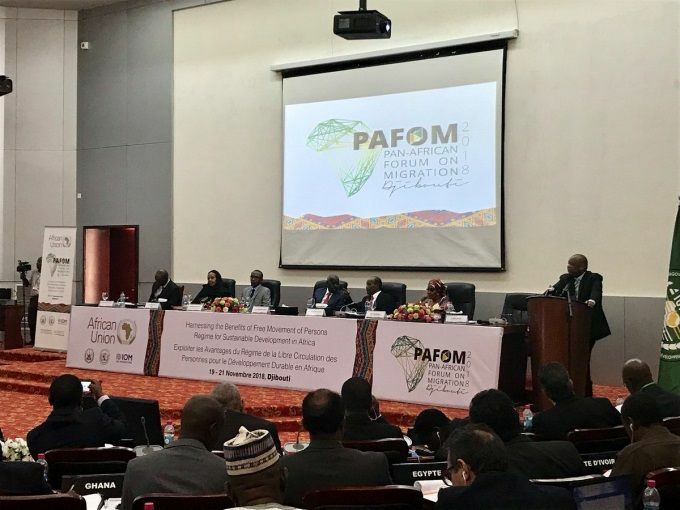 Towards a coordinated Human Mobility Agenda in Africa: Updates on the AU Continental and Regional Migration Initiatives and Consultative Processes and the future of PAFOM. 2. Sharing Experiences: Benefits and Challenges of Free Movement in Africa. 3. Labor mobility, Intra Africa skills transfer and Social Security benefits Portability: Promoting Labor migration within the context of Free Movement. 4. Boosting Inter-Africa Trade, Commerce and Tourism through Free Movement of Persons and AfCFTA. 5. Promoting Research and accurate Data as a basis for evidence based Migration Policies especially on Free Movement of Persons. 6. Fostering Social Cohesion, Integration and Security Cooperation within the context of Free Movement of Persons. 7. Addressing the needs of Vulnerable Groups including Gender issues within the context of Free Movement. 9. Summary of Outcomes & Recommendations of the Meeting and decision on the hosting for the next PAFOM in 2019. Member states presenters noted the importance of the cooperation with neighbouring states as key to create stronger border regimes and systems and emphasized that a balanced view of migration is required to increase development and security. It has been underlined that free movement can help to facilitate the transfer of skills and close skill gaps, but skills must be recognized across borders. The importance of data and information was highlighted are essential to help develop evidenced based labour migration frameworks and policies. The expected outcome will include a Draft Common African Position on Migration and on Refugees based on existing continental and regional normative and legal frameworks on migration and refugees.